Looking for a suitable place to call your financial home? Estacado FCU, where you are more than a number, you’re a Member! For more than 65 years, Estacado Federal Credit Union has been helping local residents find secure credit union solutions they can depend on. Serving residents, employees, and students in Lea County, NM; Yoakum, Gaines and Cochran counties in Texas, Estacado FCU offers a personalized banking experience to all of its members. Whether you need to open your first checking account, transfer accounts, or take out a personal loan, or start your dream education, Estacado offers a variety of products and services for their Members, including checking and savings accounts, low-rate vehicle loans. personal loans & VISAs, mortgages, and expanded online banking. In addition to regular financial services, Estacado Federal Credit Union works hard to satisfy every member and make their life easier. Estacado partners with Trustage to provide affordable protection to all members looking for life, home, auto, and health insurance. From low-cost checking and free savings, to taking out a loan online in minutes, their experienced staff will guide you through the best options to suit any needs you may have. When you need a credit union that has your best interests in mind, turn to Estacado Federal Credit Union and let them show you what it means to be part of a financial family. To speak with a member of their team regarding an existing or future account, call (575) 393-1596 today or email us at contactus@estacadofcu.com for more info. 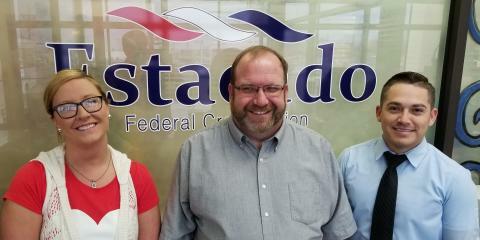 For more detailed information about Estacado and their services, visit them www.estacadofcu.com.